Hey Guys, are you waiting for the Jharkhand High Court Assistant Recruitment 2018? So, we have ultimate news for all those contenders who want to make their future bright in the government job in Jharkhand High Court Department. Here, we are going to describe all the vital information regarding the Jharkhand High Court Vacancy 2018 from the below section of the post. All the interested & skilled contenders must read this given post very attentively & grab all the important information from here. Participants may apply online from the official portal of the Jharkhand High Court department that is www.jharkhandhighcourt.nic.in. For more details about the upcoming vacancy, admit card, result etc contenders can bookmark our careerjobs360 official web page & stay in touch with us. The Jharkhand High Court Department has depicted an employment advertisement for hiring skilled & deserving aspirants on 73 Vacancies of Assistant, Cashier, Typist & Other Posts in the department. Aspirants who want to do a Government Job in Jharkhand High Court then they don’t miss this opportunity & may apply online for the Jharkhand High Court Cashier Recruitment 2018 from the official website of the Department. Aspirants may submit the online application form on or before the due date which is 23rd October 2018. You can check the more details of Jharkhand HC Assistant Jobs 2018 such as Eligibility Criteria, Important Dates, Application Fee, and Selection Process etc. are provided below in the article. The Jharkhand High Court is one of the High Courts in India. It was formed in the year 2000 under the Bihar Reorganisation Act, 2000, after the state of Jharkhand was carved out of the Bihar state. The court has jurisdiction over Jharkhand state. The seat of the Jharkhand High court is at Ranchi, the administrative capital of the state. For Assistant Librarian Pots: Contenders must have a Graduate from a recognized University in Library Science with a minimum percentage. For Typist Post: Aspirants can Contenders must have University having a typing speed of 40 words per minute in English. Preference will be given to the candidates having knowledge of typing in Hindi also. For Assistant Post: Contenders must have complete their Graduation from any well recognized University having knowledge of working on computers with sound knowledge of typing on the computer. For Cashier Post: Contenders having the qualification is Commerce/ Economics Graduate from a recognized university. For Translator & Jr. Translator Posts: Contenders must have complete Graduate from a recognized University. For more details, you can visit the official notification of the department. Application Form fees: The aspirants must have to pay Rs. 500/- for Unreserved, B.C. I and B.C. I category of aspirants and Rs. 125/- for SC/ ST category of aspirants. Selection Process: Aspirants will be selected on the basis of their performance in written exam or personal interview round which is going to be conducted by the Jharkhand High Court Department. 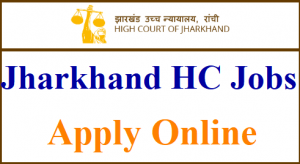 How to Apply offline for Jharkhand High Court Recruitment 2018? Initially, Interested Candidate may log in to the official website of Jharkhand High Court Department at www.jharkhandhighcourt.nic.in. Then go to the homepage and find out the Jharkhand High Court Recruitment 2018 notification link. Then, open the notification in the next web page. Then, download the official notification. And Read all the instructions very carefully which is in the official notification. If you are eligible and then Fill the application form with all asked details. Attach all the scanned copies with self-attested certificates with the application form. Paste the photograph and signature on the application. Then recheck the application form. Now, submit the application form at the given postal address in the official notification. Finally, take the print out copy of the application form and keep it safe for further use.